One of this writerâ€™s favorite sedans, the 2015 Kia Optima gets a few updates such as optional UVO telematics system. Trim levels have been changed slightly and the SX Limited is now the SXL. We like the new sport steering wheel. A sedan fan, I found a couple of cons while driving the Optima: the feel of being closer to the ground when taking bumps/dips, and the driverâ€™s seat ill-fitting. The latter isnâ€™t a feature criticized by most writers, but I couldnâ€™t seem to get the right fit. For instance, the headrest felt intrusive against the back of my head and the seats not as supportive as I would have liked. Competition for the Kia Optima includes its stablemate the Hyundai Sonata, Ford Fusion, Mazda 6 and Nissan Altima, to name a few. A crowded market, family sedans may be a dying breed. Although we hope not. We much prefer a sedan over an SUV. The standard engine in the 2015 Kia Optima is a 2.4-liter four-cylinder engine, with 192 horsepower and 181 pound-feet of torque. Kiaâ€™s 2.0-liter turbocharged 4-cylinder engine (274 hp and 269 lb-ft of torque) is available as an option on the SX and standard on the SXL. All models are front-wheel-drive and equipped with a six-speed automatic transmission. We favor the quilted seats. Kia Optima maintains a long list of standard safety features, including four-wheel antilock disc brakes, traction and stability control, side airbags and side curtain airbags. Available are a rearview camera, rear parking sensors, rear cross-traffic alert and a blind-spot monitoring system. The optional upgraded Uvo telematics system (on the EX and above) includes roadside assistance, collision notification and driver restrictions and tracking for secondary drivers. Ways in which the Kia Optima stands out from other sedans are first, its styling. Itâ€™s easy to spot and unmistakable with its curves and lines. 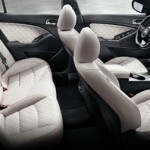 We especially liked the new Nappa leather seating, with criss-cross lines. It appears more durable and added some style. Standard and optional features on the Kia Optima include many and for the price of this sedan, we think consumers get a fuller package. The cabin is roomy, up-do-date and well laid out. We especially like the new squared-off steering wheel, much like the one in the new Corvette. Nice touch, Kia! Trim levels in the Optima include the entry level LX with a host of standard equipment, including Bluetooth, cruise, height-adjustable driverâ€™s seat, tilt/telescoping steering wheel. Anteing up for the Convenience Plus, consumers enjoy laminated front windows, rearview camera, auto-dimming rearview mirror and Uvo telematics system. 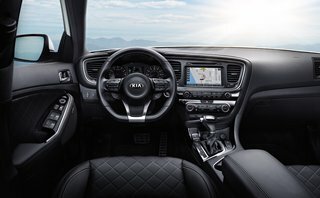 On the EX trim level, Kia adds upgraded windows, power driver seat and auto-dimming mirror, all standard equipment. Wheels are 17-inch alloy, and keyless ignition/entry, dual-zone automatic climate control, rear air-conditioning vents and leather upholstery are all standard. If youâ€™re the sunroof type, you can add on the EX Premium package and enjoy the panoramic roof, rearview camera, upgraded Uvo version, 4-say passenger seat, power-folding mirrors, heated steering wheel, heated/ventilated front seats, heated rear seats, driver memory settings and an eight-speaker Infinity sound system with HD radio. Our test vehicle, the SXL Turbo came equipped with all the standard features in the EX optional packages,18-inch wheels, unique interior and exterior trim, LED foglights, electronic parking brake and premium Nappa leather upholstery, with woven pattern. Without the Turbo engine, the SX trim level gets the Premium Technology package, adding those items available in the EX’s Premium and Technology packages. For the turbocharged SX, the Premium and Technology packages are separate. Government safety ratings are high for the Optima: Five stars for overall safety and a top score of â€˜good.â€™ Go to www.safercar.gov for complete information. Kia’s Uvo telematics electronics interface system resembles Ford’s Sync system but seems easier to work with. Uvo provides voice control of cell phones, MP3 players. The system also operates POIs and turn-by-turn navigation. The touchscreen interface in navigation-equipped Optimaâ€™s is also easy to use and has a nice bright screen with pleasing graphics. Operating XM is also simple. The Kia Optima remains one of our favored sedans for many reasons. Certainly styling and ease of driving fall at the top of reasons. We didnâ€™t find the driverâ€™s seat all that accommodating, however. This writer couldnâ€™t get comfortable and wished for a more form fitting seat (sportier seat?). Pros include the Optima cabin, ease of controls and cost. If the Optima has any faults those may be the fact that the positive styling makes for cramped headroom for rear seat passengers. Fuel economy could be better (23/34 mpg. For the 2.4-liter, 16 valve engine and 20/31 mpg for the Turbo). Donâ€™t expect the Optima to have a sporty personality; at least not as sporty as, say the Infiniti Q50 or Mazda 6 sedans. 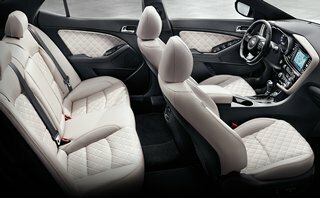 The ride can be stiff in the Turbo version and rear seat headroom can be tight due to Optimaâ€™s snazzy styling. Miles-per-gallon also suffer some, in comparison. And, as with most turbocharged engines we drive, that lag can show up at the worst of times: making a turn in front of traffic. EPA fuel economy: 20/31 mpg.